RUSH: Hey, hey, folks, quick question here. Would it matter to you if you found out that Mitt Romney was a member of a socialist third party back in the 1990s, who wanted to basically make America like a Western European social democracy? Would that matter to you? It would? Would it matter to you if Romney were a member of the Nazi party back in the nineties? So you think it would disqualify Romney? If you found out that Romney was a member of a left-wing socialist third party and did everything he could to cover it up and lie about it, that’d matter to you now in 2012? You’d give him the thumb, he’s gone. All right. Well, would it matter to you if Barack Obama, it was learned, was a member of a third party, Socialist Party, who had as its objective to transform America into a Western European socialist-type Democracy? In 2012, would that matter to you? Other than the Democrat Party, right. Would it matter to you? Well, ’cause in Obama’s case, it’s true. Hi, folks. How are you? 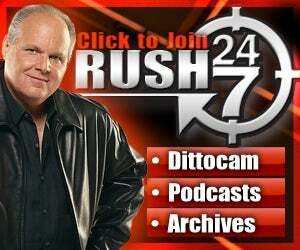 Rush Limbaugh, and we’re here at 800-282-2882 if you want to be on the program. E-mail address, ElRushbo@eibnet.com. Stanley Kurtz, who writes at National Review and National Review Online, has been tracking — it’s almost been a career move for Kurtz, the last four years — been tracking the radical past of Barack Obama. He’s the best at ferreting it out. He’s one of the few who’s had any interest in it in the mainstream journalism community as it were. He has written a book. We have interviewed, we’ve talked with Stanley Kurtz for the Limbaugh Letter I think on a couple of occasions about this. And he now has a post, an update based on more research, Stanley Kurtz does. This party that Obama was a member of, it’s exactly what he’s done in his 3-1/2 years. “The partyÂ’s official ‘statement of principles,’ which candidates seeking endorsement from the Chicago chapter were asked to support, called for a ‘peaceful revolution’ and included redistributive proposals substantially to the left of the Democratic Party.” Now, this is in 1996. The Democrat Party, you can’t get to the left of ’em anymore. You can’t. Hitler was to the right of the Democrat Party when it came to social policy. Would it matter to you if you learned that Romney was a member of a socialist third party in the nineties that had as its objective to socialize this country and make it look like a Western European social democracy, outside the two-party system? Would it bother you? Would it be relevant to you today? RUSH: Another pull-quote from Stanley Kurtz. I just want to read this again: “[L]et us see whether a press that let candidate Obama off the hook in 2008 — and that in 2012 is obsessed with the presidentÂ’s youthful love letters — will now refuse to report that President Obama once joined a leftist third party…” I don’t think there’s any question they’re gonna refuse to report it. We got an entire biography out now by David Maraniss about Obama, and he doesn’t mention it. He mentions what Kurtz refers to here as the “youthful love letters” to the composite girlfriends. But in this giant biography, there’s not a mention of Obama having joined the New Party. This is important stuff. The press is not talking about it. They’re covering it up. This was a candidate in 2008 who lied and did everything he could to cover up all of his past associations. We were not supposed to talk about Bill Ayers, to the point that people are now tired of hearing about it (at least on our side). We were not supposed to talk about Jeremiah Wright then, and we’re not supposed to talk about Jeremiah Wright now, either. And we’re not supposed to talk about Bernardine Dohrn, Bill Ayers’ wife. We’re not supposed to talk about anything! No, no, no, no. We’re supposed to talk about…? I don’t know. Whatever they permit us to talk about. But Kurtz has gone back and dug this up. “On the evening of January 11, 1996, while Mitt Romney was in the final years of his run as the head of Bain Capital, Barack Obama formally joined the New Party, which was deeply hostile to the mainstream of the Democratic Party and even to American capitalism…” And he’s running against American capitalism now! His speech at Osawatomie, Kansas. I keep citing it. This past year, within the past six months, Obama was redoing a great speech Churchill made at Osawatomie. He said America hasn’t worked. It’s never worked, he said. Capitalism, America, greatness, it never happened. These two hundred-plus years have been a failure. Only now, in the last 3-1/2, are we finally on the right track. So everything Kurtz has dug up here is factual and true by virtue of what Obama’s doing today. “Fight the Smears, an official Obama-campaign website, staunchly maintained that ‘Barack has been a member of only one political party, the Democratic Party.’ I rebutted this, but the debate was never taken up by the mainstream press. Recently obtained evidence from the updated records of Illinois ACORN at the Wisconsin Historical Society now definitively establishes that Obama was a member of the New Party. He also signed a ‘contract’ promising to publicly support and associate himself with the New Party while in office. “Minutes of the meeting on January 11, 1996,” Kurtz found ’em. I’ve got ’em. I’ll read partially when we get back. RUSH: Do you remember, by the way, all the time the press spent digging up the third party ties of Todd Palin? Remember all of the stink they tried to raise about that, that Todd Palin joined some Alaskan independence third party? So Kurtz has uncovered it. “Minutes of the meeting on January 11, 1996 of the New PartyÂ’s Chicago chapter read as follows: Barack Obama, candidate for State Senate in the 13th Legislative District, gave a statement to the membership [of the New Party] and answered questions. “He signed the New Party ‘Candidate Contract’ and requested an endorsement from the New Party. He also joined the New Party.” It’s from their minutes. Unless they’re lying to their own diary. Unless the New Party is lying to itself, in its own written record, Obama joined the New Party, swore allegiance, and has done everything he can to hide it from everybody. And the press is a willing accomplice in keeping it a secret. And it’s just a relevant question. See, I don’t think there’s any doubt that he’s a socialist. These guys went on for a whole hour about all they didn’t know about Obama. They’re journalists. It’s their job to find out! But they didn’t care. I didn’t mention this two days ago but now this has context and relevance. And it’s hilarious. It’s an AP story from Monday, June the 4th (so it’s three days ago), by a guy named David Crary. The headline: “Obama a Socialist? Many Scoff, But Claim Persists.” And I, your host, am even mentioned in this article. 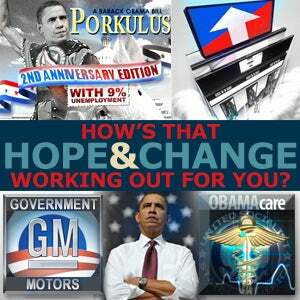 “When President Barack Obama’s re-election campaign unveiled its new slogan, some conservative critics were quick to pounce. ‘Forward,’ they asserted, is a word long associated with Europe’s radical left. Its choice reaffirmed their contention that Obama is, to some degree or other, a socialist — a claim that surfaced early in the 2008 campaign and has persisted ever since, fueling a lively industry of bumper stickers and books. ‘New Obama slogan has long ties to Marxism, socialism,’ read a headline in The Washington Times. Yeah, to screw ’em there after. “Even some of his strongest critics acknowledge that his [regime] hasn’t sought one of the classic forms of socialism — government control of the nation’s means of production.” What do you think the whole “green energy” thing is about, Mr. Crary? You realize these people can’t make the giant power grab all at once. What do you think buying General Motors was all about? You buy General Motors and then you force people to go out and buy electric cars. You fund the solar industry business and the wind business, and then you fund them right into bankruptcy. Controlling the means of production. You put bans on light bulbs. I mean, what are we talking about here? The utter futility of the denial of AP. “Terence Ball, a political scientist at Arizona State University, said ‘socialist’ has gained currency as an anti-Obama slur because ‘the “L”‘ word (liberal) has lost it shock value.’ No, it hasn’t. No! It’s because words mean things, Mr. Crary and Mr. Ball. (“Ball,” it is. Terrence Ball.) Words mean things. Obama just gave the nation’s highest civilian honor, the Presidential Medal of Freedom, to an avowed socialist Marxist leader. Dolores Huerta, the honorary chair of the Democrat Socialists of America. Why is he covering it up if it’s no big deal, Mr. Crary? Why is he going out of his way to make sure that nobody reports the existence of his ties to the New Party? (interruption) Where am I mentioned? I don’t know. I haven’t read it. Ah! “Radio host Rush Limbaugh,” the most-listened-to radio talk show host in history, “was among several conservatives who chided Romney for his reluctance to call Obama a socialist outright. ‘You know, I keep forgetting the fact that Obama is black is why we can’t call him a socialist,’ Limbaugh said on one of his [most-listened-to-in-the-country] shows. “‘That had slipped my mind because when I look at Obama, I don’t see black. I see a socialist. I see a Marxist,'” and I still do, by the way. So, anyway, the story’s out. Stanley Kurtz has it. It will be ignored. The press had in this AP story three days ago going on and on and on about how no way Obama’s a socialist. It’s just a panicked, typically extreme right-wing criticism. RUSH: If liberal has lost its punch, its shock value, then why do liberals want us to now call them progressives, hmm? Doesn’t matter. “Liberal” works every time it’s tried. “Socialist.” You know why socialist hasn’t worked in the past? It’s like communist hasn’t worked in the past. I will tell you exactly why. I realized this many moons ago. A little Indian lingo there, a little Elizabeth Warren lingo. The American people simply don’t want to believe that they have elected a socialist. When you start calling members of the Democrat Party communist, it didn’t work. People didn’t want to believe it. It was too outside the realm of what was reasonable. The communists were people like Castro and Gorbachev. Well, not Gorbachev, they loved him. Khrushchev. Yuri Andropov, Brezhnev, big eyebrows and stuff, mean guy, Mao Tse-tung. The idea that an American could even be one of those people was just, no. Calling somebody communist didn’t work. Socialist, much the same cache. Now I think it’s profoundly different. Socialists are happy to be called that. There are many socialists in the Democrat Party. One of them identifies himself as such, Bernie Sanders. It still is not helpful. It can still be an albatross around somebody’s neck. That’s why they don’t want it used because now it does have cache, now it does work, because now we’ve got one. People begin to see what happens when an entire political party that’s drifted into socialism and doesn’t hide it anymore, what happens to the country when they get power. And you’re seeing the voters’ reaction to it if you just have the honesty to believe it, 2010 midterms, every election where Obama and his policies or his representatives have been on the ballot since the presidential race in 2008, every election the Obamaites have lost big. The real question going into the Wisconsin recall of Scott Walker, is, what made them think they were gonna win? What made them think they had a chance? They’d already tried to recall Walker, Senate members. Walker had already beaten Barrett in 2010. The unions and the Obama allies hadn’t won anything in Wisconsin. What made them think they were gonna win this? They were engaged in blind faith, and they thought all these bussed-in thugs from out of state and all the money, but it was never in the cards. So the point is it’s something they still, when it comes to Obama, have to do everything they can to shield and hide. See, accusing somebody of being a socialist today works. Ten years ago, it would have been met with “That’s nuts, Rush, you’re too extreme. I don’t want to hear that. Come on. It’s too easy. You’re being intellectually lazy.” I heard that. Now it works, and that’s why rather than the other side laughing at it, making jokes, they’re trying to do everything they can to hide it.